Rent Gardener Ranch | Corporate Events | Wedding Locations, Event Spaces and Party Venues. Tucked along the banks of the Carmel River lies Gardener Ranch. The rustic property, within walking distance of charming Carmel Valley Village, has a rich history of hosting Presidents, Dignitaries, and Movie Stars seeking exclusive, private, and rustic charm. The property is an idyllic 24 acres of majestic oaks and lush meadows, on the pristine banks of the Carmel River. Historically, the property has hosted special events ranging from corporate functions to family reunions and weddings. 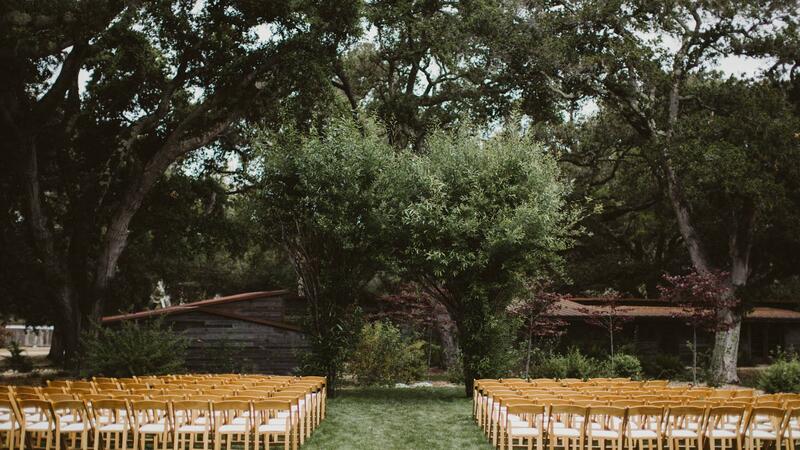 Gardener Ranch combines the rustic charm of Carmel Valley with the simple elegance of our natural setting to give you the wedding of your dreams. This Carmel wedding venue gives you the best in terms of outdoor ceremony location. Choose from 5 stunning outdoor sites that feature views of the Carmel Valley River, towering oak trees, or lush grass as far as the eye can see. The celebration doesn’t need to start at the wedding; Gardener Ranch provides a variety of settings for Rehearsal Dinners, Receptions, Spa days, and more. Escape from the hectic world with your own private retreat designed to perfection and limited only by your imagination. Gather your friends and coworkers for the experience of a lifetime at Gardener Ranch. Connect with the beautiful natural setting surrounding you as well as with each other. Appreciation at its finest with sprawling meadows open for play, a commercial kitchen to provide gourmet food or gourmet cooking classes to complete the team building experience. Gardener Ranch, corporate event site extraordinaire, can accommodate any team building activity and provides enough outdoor and indoor spaces for any and all types of entertainment. Enter the Ranch and leave the rest of world behind.